Millennials, born from 1980 to 2000, take a unique approach to saving and spending. Some are rich in knowledge about technology, and many have made fortunes starting or investing in tech startups. However, other millennials fall short of being wise with their money. 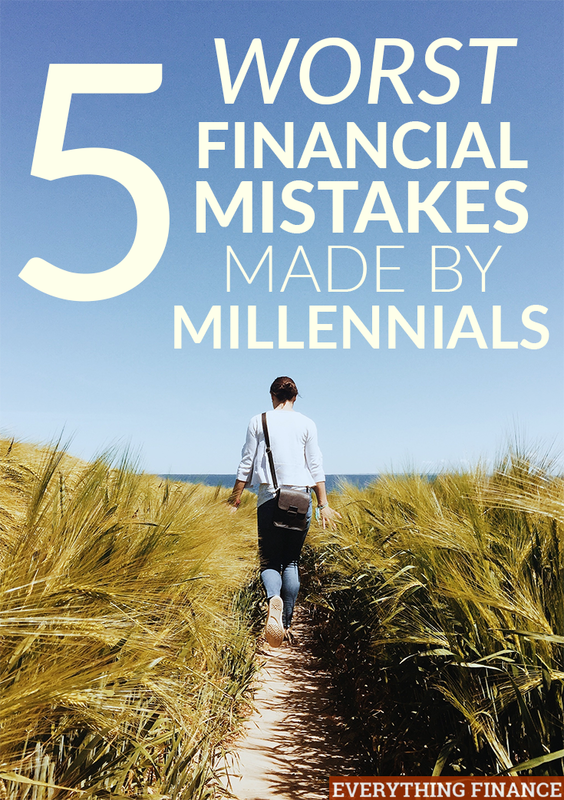 Here are the top 5 financial mistakes millennials make (that you shouldn’t!). You’re young and have the whole world ahead of you. Taking on large amounts of debt seems like a no biggie, especially since you have so many years to pay it off. However, this faulty thinking could keep you in debt for many, many years. The majority of graduates have $30,000 or more in student loan debt. Add that on top of a car loan, and good luck getting ahead in your finances or qualifying for a mortgage 5-10 years down the road. Another big thing millennials tends to skip out on is their retirement fund. The major two reasons retirement savings is ignored by individuals in their 20s is because they think they have enough time to start, and they’re not in their dream job. Start your retirement savings now and benefit from having time on your side to grow your investments. Retirement savings is non-negotiable, even if you’re young, aren’t in the perfect job yet, or have too many other bills to pay. Feel like you’re always living paycheck to paycheck? You’re not alone. However, you’ll never get ahead if a financial emergency is always threatening your budget. Saving $1,000 for emergencies might seem like a huge task, but having the savings will keep your finances intact if a car or medical emergency hits your wallet hard. Another common mistake the younger generation makes is to take health insurance for granted. Sure, you might look and feel healthy. However, if a medical emergency does happen, you’ll be overwhelmed with the costs. An ambulance ride and hospital stay for a car accident or serious injury can cost you thousands of dollars. If you can’t get health insurance through your place of work, there are still options on the marketplace. Yes, it might be hard to balance your budget when you have to pay a monthly payment to a health insurer, but doing so can prevent major debt later down the road. A healthy credit score is essential for many areas of your life. A good credit score can help you secure a car or personal loan or mortgage. Your credit score is also needed when you’re renting an apartment or house. Some employers, especially ones that give a security clearance, even check credit scores before they hire an individual. It’s important to use your credit card wisely, keep your debt-to-income ratio healthy, and to always make your payments on time. The older generation is quick to harp on millennials, but the financial mistakes millennials make are quite common throughout all generations. Hopefully by reading this, you have a better sense of what mistakes you might be making, and how to avoid them. Are you guilty of making any of these mistakes? How did you correct them, and how long did it take? I have never understood the “I don’t need health insurance because I’m healthy” argument. Insurance is to protect you from things that are unexpected. I don’t know buy auto insurance because I know I am going to get in an accident. It is there to protect me when something happens that I might not have control over. The same goes for health insurance. While these mistakes may be more common among millennials, I don’t see them as necessarily unique a particular generation. Our society as a whole, regardless of age, seems to fall victim to just about all items on the list. This 2016, I will try as much as possible to commit financial mistakes. I would try again build my emergency fund and increase my retirement savings. And, I hope to achieve this year is that I want to buy long term life insurance. I seriously believe that millennials lack the right perspective. I am in no way questioning the financial prudence of those leading tech start-ups and all but I had actually read somewhere that according to a study, millennials, in general are more confident about earning more than their predecessors – they don’t know how and they also know that they are going to struggle with worse debts than what their parents had/have. I am guilty of number 2. I used not care about my retirement because I thought the government was taking care of it. But, that changed until I realized my financial goals. I wanted a better retirement years of my life and I wanted to retire earlier with the right amount of money.